Snippets of Jack: "Rascals, Scoundrels, Villains and Knaves"
"Rascals, Scoundrels, Villains and Knaves"
Oh my where to begin. Jack Sparrow might be the best pirate ever but he has a pretty amazing crew. Oh and some quirky nemesis'. So i'm going to list my top 5 favorite crew members and villains. So batten down the hatches its going to be a bumpy ride. Lets face it, Joshamee Gibbs is the most loyal friend on the face of the planet. Even when his captain has some pretty ridiculous plans, he just goes with the flow. And he has saved Jack's life about 100 times! But most importantly he always has a bottle of rum on hand. Hector plays both sides of the fence in this post and in most of the movies. Is he friend or foe? Well I think his most hilarious moments take place when he and Jack are fighting over pointless things. 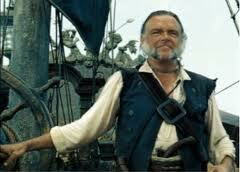 But his moment of glory took place when he led Jack's crew to the land of the dead and saved our beloved Jack Sparrow. 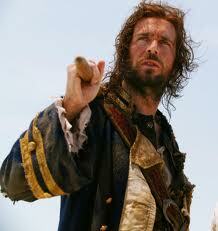 But he and Jack will always fight for control of the Black Pearl. Even though we all know Jack will win out in the end. James was an officer of the Royal British Navy. And searched long and hard for Jack Sparrow and finally captured him, But of course Jack escaped...twice. Well the Navy wasn't so happy about that and relieved him of his position, He ended up in a bar dirty and according to Jack smelling pretty bad. He joined Jack's crew; and eventually fought in one of those legendary sword fights between Jack and Will. 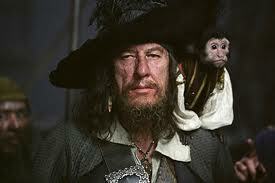 He escaped unscathed and stole the Heart of Davy Jones, promptly took it too his former boss Lord Cutler Beckett. 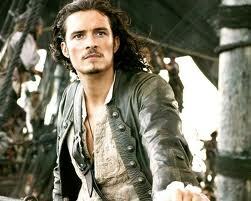 Later in life he sacrificed his life for his former fiance Elizabeth Swann. 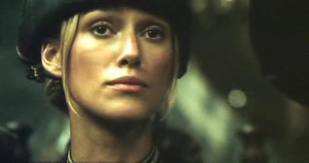 Elizabeth is the daughter of a Governor, and used to be the sworn enemy of all pirates. Until she fell in love with one that is. But she like everyone has faults; one of the most egregious offenses was the attempted (and partially successful) killing of Jack Sparrow. But then she and the crew saved him. She now leads the life of pirate wife to the master of the sea. But she will never forget that kiss she and Jack shared while she handcuffed him to a poll and left him to be eaten by the kraken. And neither will we...But we still love her.